Earlier this month a judge awarded damages to the Parr family in Texas amounting to almost $3million for losses on property value, physical pain, mental anguish and suffering due to the effects of pollution caused by fracking near their home. The jury returned a verdict saying Aruba Petroleum Inc. “intentionally created a private nuisance” resulting in the Parr family suffering from symptoms including chronic nose bleeding, irregular heartbeats, muscle spasms and open sores due to the environmental effects of this controversial gas mining process. Aruba are the first company in the US to be found guilty of charges due to pollution caused of fracking. Hydraulic fracturing (fracking) involves drilling horizontally deep under the earth and injecting fluid at high pressure to fracture shale rocks and release natural gases. This gas is then used as fuel for energy. It is considered by many to be extremely harmful to the surrounding environment and has divided opinion across the world as to its viability as a safe method of mining for fuel. Ten countries including Spain, France, Germany and South Africa have already banned this controversial mining process over concerns about pollution and the environmental risks. It’s believed by many that fracking can pollute water, release dangerous methane gases that damage the ozone layer and even cause earthquakes. The landmark verdict in Texas indicates that many of these claims are actually true, but what are the fracking facts? Around 600 toxic chemicals are used in the fluid used for fracking, including uranium, radium, hydrochloric acid, mercury, lead, formaldehyde and even bizarre substances like instant coffee and walnut shells. It takes around 1-8 million gallons of water to complete each fracking job and each gas well needs an average of 400 tanker trucks to carry all the water and supplies to and from the site. This produces about300,000 barrels of natural gas a day. There are around 500,000 active gas wells in the US that use in total around 72 trillion gallons of water and 360 billion gallons of chemicals in the fracking process and only 30-50% of the fracturing fluid is recovered. The rest of the toxic fluid is left in the ground and is not biodegradable. 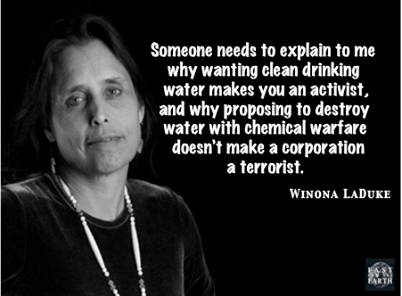 Canadian mining companies do not disclose all of the chemicals used for fracking or their quantities. Most oil and gas wells in Canada don’t have to go through an individual environmental assessment process or disclose any information about the chemicals they use on the Canadian National Pollutant Re­lease Inventory (NPRI). This means that the companies themselves decide what information they want to release about what’s in their fracking fluid, despite the fact that tests have shown that many of the chemicals they use are known to cause serious health problems such as cancer or organ damage. In British Columbia, the B.C. Oil and Gas Commission, who are the organisation responsible for promoting oil and gas development, are also the organisation that regulate fracking. Contamination of fracking fluids from one well to another have been reported in British Columbia and there are well-documented cases of water contamination caused by fracking in several countries around the world. A 2011 study by the U.S. Environmental Protection Agency confirmed a clear link between fracking and water contamination and there have been over 1,000 documented cases of water contamination next to areas where companies have used the fracking process to drill for gas. This contaminated water is usually used for drinking water in nearby cities and towns. In Pennsylvania, USA, there has been a rapid development of the Marcellus shale site, which it’s estimated could produce 500 trillion cubic feet of gas. It’s believed that’s enough to power all American homes for another 50 years. In 2010 Pennsylvania officials fined Chesapeake Energy $1 million for contaminating water supplies in Bradford County. Because the company had not properly cemented its drilling boreholes, methane gas escaped from the well and contaminated the water of 16 families. Between 2009 and 2011 there have been a series of surface spills of toxic fracking fluids and two blowouts at wells operated by Chesapeake Energy and EOG Resources. There was also a spill of 8000 gallons of fracking fluid at a site in Dimock, Pa., which contaminated groundwater in the Marcellus Shale region. Supporters of fracking claim that it is a proven gas extraction method that has been used for decades. However, according to Dr. Anthony Ingraffea, a hydraulic fracturing expert from Cornell University, mining companies have had less than 10 years experience of using the fracking method on a large scale. Robert Mair, a Professor of Geotechnical Engineering at the University of Cambridge chaired a committee to analyse the environmental, health and safety risks of fracking in Britain. He concluded that it should only take place at depths of several kilometres. At present the fracking in Britain has been at depths of 1.06 miles (1.7km) and 1.93 miles (3.1km), which would make water contamination “unlikely”. This risk could be increased by poorly constructed and badly regulated wells, an area in which Britain has an excellent record. However, Professor Mair recommends that methane emissions and groundwater composition should be monitored at potential sites before any fracking takes place. Rex Tillerson is the CEO of ExxonMobil who are the biggest natural gas producer in the US and heavily rely on fracking to extract it. It’s his job to promote fracking and fight regulations preventing mining. However, when a fracking project was proposed near Tillerson’s $5 million Texas home, he joined a lawsuit to block its construction with the damaging consequences of fracking cited as one of the main concerns. 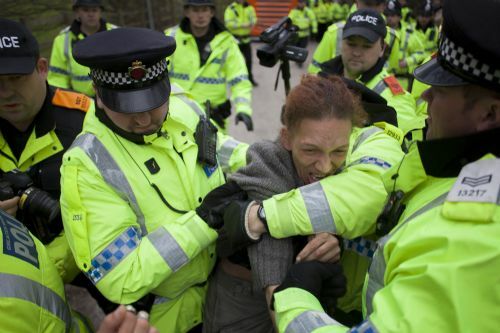 The coalition government in the UK have offered tax breaks to councils who allow fracking projects to go ahead. However, Michael Jones, the leader of Cheshire East council, which is the same constituency of coalition chancellor George Osborne, opposes the use of fracking, stating: “Fracking may well be a useful technology for other areas and good luck to them if it is, however the people of Cheshire East have our assurance that there won’t be any in our borough.” Meanwhile Prime Minister David Cameron is trying to push through legislation to change anti trespass laws so that fracking firms can drill underneath private land without the owners’ permission. 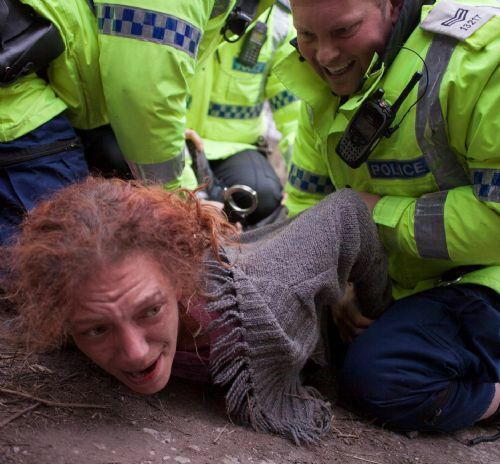 The Daily Mail reported details of the arrests of 82 protestors at the Barton Moss site in Salford, in England earlier this year, with police accusing protestors of offences ranging from ‘assault, damage, harassment of residents and workers, a flare fired at the police helicopter and threats to kill’. However, what the popular press have not reported on is the fact that no successful convictions have resulted from these arrests, despite policing and court costs costing the UK taxpayer almost £1,000,000 so far. 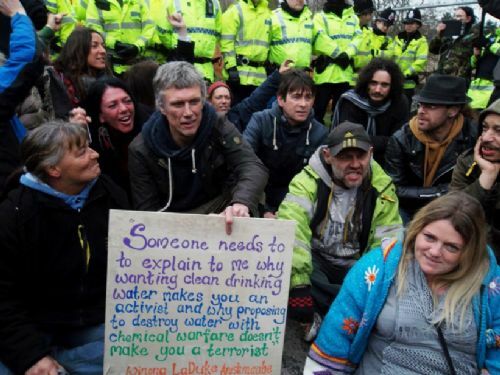 However, the independent newspaper The Salford Star has documented the events surrounding the Barton Moss fracking protests and reported that five of those cases have already been dismissed by judges in courts in Manchester. In summing up one case the judge said that he found the absence in court of key officers involved “astonishing”. 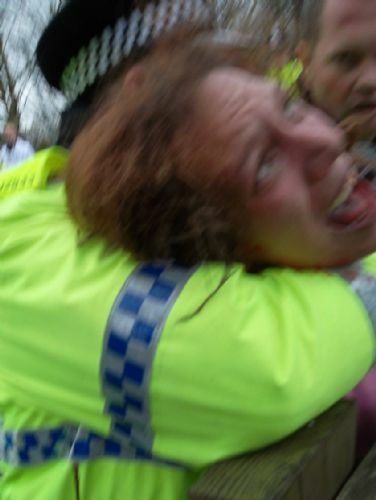 Vanda was charged with “assaulting a constable in the execution of his duty, resisting a constable in the execution of his duty and assaulting a detention officer” and “remanded in custody to further appear on 25 March 2014” (GMP quote). As the fracking debate continues one fact remains certain, our society needs energy and there are alternatives that are scientifically viable. There are a number of renewable energy sources that are in use today. The most familiar ones are solar power, which generates energy from the sun, wind turbines that harvest power from the wind, wave and tidal power that generate energy from the sea, and hydroelectricity that draws energy from the gravitational force of flowing water. Other lesser known alternatives include geothermal energy which is generated from natural heat within the earth itself and cold fusion which generates energy from non-toxic and radiation-free nuclear reactions. Biomass energy uses biodegradable rubbish and burns it as fuel and also uses plant matter to generate electricity. The sunlight captured by plants is transformed into chemical energy and then converted into electricity, heat, or liquid fuels. Aside from all these alternative energies we also have the technology to build energy efficient homes and buildings. Buildings that not only save energy, but also produce energy. So with all these alternatives to pursuing environmentally damaging mining processes and burning toxic fossil fuels, any sane man would wonder why more isn’t done to develop these alternative methods of energy production. Well the answer is simple – money. The motivation for investing in the pursuit of these alternatives is anchored to the noose of capitalism. Whilst the capitalist imperative continues to be the voracious pursuit of wealth for individual, selfish gain, energy will always be coveted as an economic advantage and a source of control for the nation or corporation that has it. Yes it would make much more sense if governments and corporations and all of those greedy corporate psychopaths, oligarchs and megalomaniacs dipped into their Swiss bank accounts and threw all their financial resources at environmentally viable energy solutions with the same enthusiasm shown for funding commercially viable projects like an Olympics or World Cup. It would make more sense than spending billions on military equipment to go and murder hundreds of thousands of people in wars for the control of oil and gas in countries in the Middle East. It would make more sense than exploiting the natural resources and environmental beauty of South East Asia, Africa and South America and brokering deals that circumnavigate all the wealth from those countries into the pockets of a small, undeserving minority, whilst subjecting the poor of those countries to lives of impoverished degradation. It would make more sense, it just wouldn’t be financially viable for that small percentage of people in the world that have all the wealth but none of the ethics. Meanwhile, whilst those people pursue the best way to become even more wealthy from sucking OUR planet dry, we continue to fret about how we are going to pay them for it. If this doesn’t make us mad then we’re already crazy, so could the last person to leave the asylum please turn the lights out. Bez of the Happy Monday’s joins the anti-fracking campaign at Barton Moss.